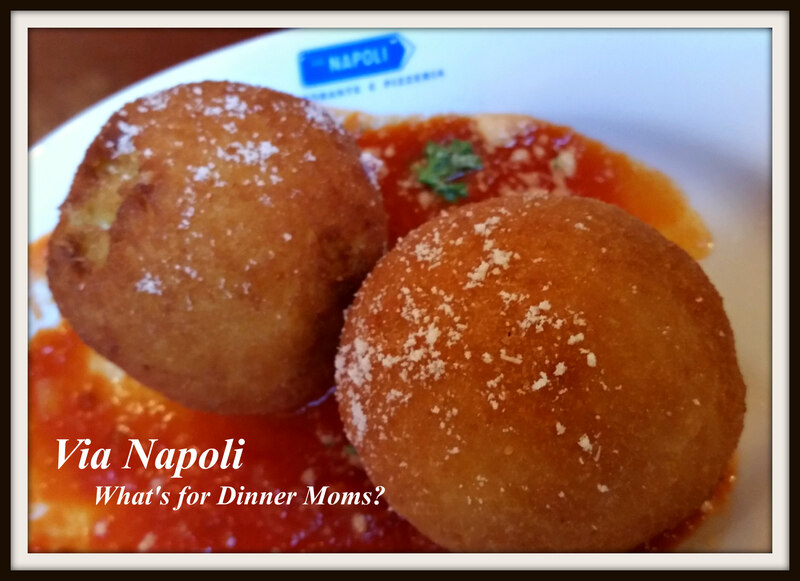 Via Napoli – What's for Dinner Moms? Hope you enjoy this post about Disney World while we are at the State Science Olympiad Competition this weekend. My son is competing in Fast Facts, Crime Busters, and Rocks and Minerals. GO SCIENCE! 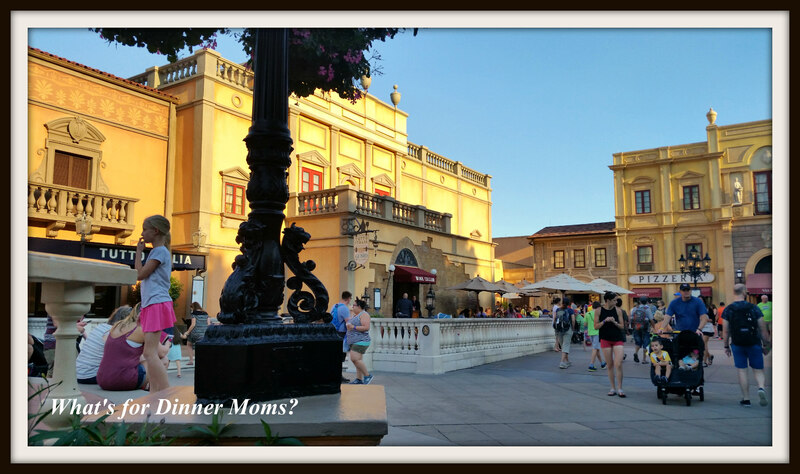 For some reason this is the first time we have really explored the Italy area in Walt Disney World. I don’t know why but it seems the one country that we always pass by. I think it is at the breaking point for us in working our way around the world so it always seems to be we will stop at this point and work our way around the other way on our second day of visiting the World Showcase. Somehow, we never quite seem to make it back. To solve that problem I chose to make an Advance Dining Reservation at Via Napoli so we would be able to finally explore Italy a bit more in-depth. The entrance to Via Napoli is tucked into the rear of the area next to the Pizzeria sign. Our reservations were for 6:40 pm and we arrived at 6:30 to a packed area around the check-in at Via Napoli. We got in what we thought was the line to find out after a few minutes were just people waiting in line to be seated. There is no area near the restaurant to wait to be called for your reservation so everyone stands in the little vestibule and doorway. I would have to say that was very annoying as the area was very congested for people trying to check-in and I have trouble standing for long periods of time so I went to find a seat and sent my son to stand near the restaurant so he could wait until they called our name. The first thing I noticed was that the restaurant had very high ceilings and was very airy and bright. As I looked to my left I saw the three great pizza ovens I had read about. There were several large parties of 10+ people seated near us but I did not feel overly crowded in the restaurant. What bothered me most was that we could not hear each other talk. I had to ask the waitress several times to repeat herself as she was soft spoken and the noise from the diners, waiters, and clanking dishes was insane. Since the restaurant had high ceilings and no partitions other than a few carts placed around the room for the waiters to grab dishes, napkins, drinks, etc… There was nothing to absorb all the noise in the restaurant. My poor hard-of-hearing daughter can read lips but this was a nightmare for her. But, that said the food was delicious! We started with Arancini. Neither one of my children had ever had it before and both loved it. It was a nice way to start our meal. We also ordered the bread for our meal. 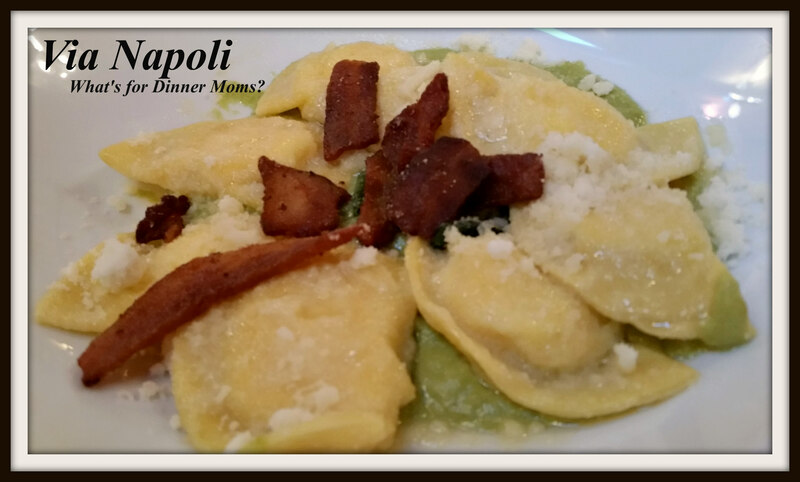 My daughter ordered the special of the day – cheese ravioli on a bed of mashed edamame, with fried prosciutto. At first she was a bit disappointed in the size of the serving when her dinner was placed in front of her. I told her that ravioli is one of the foods that is super filling and you don’t need very much. She was very pleased with the flavor and the serving size by the end of her meal. 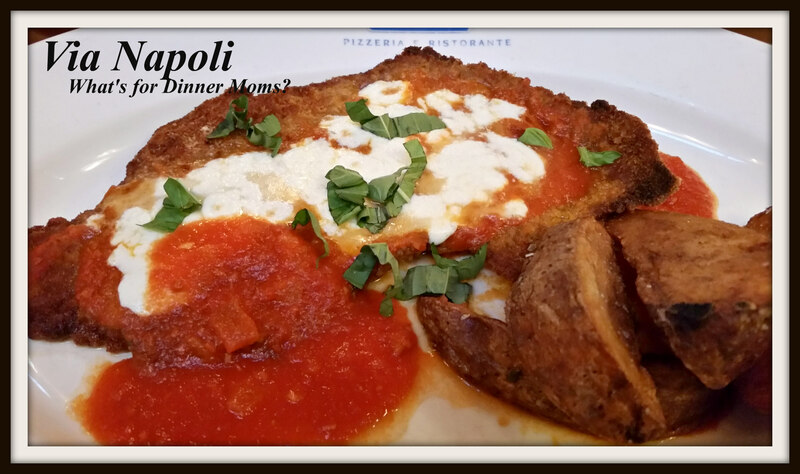 I think the veal parmesan was hands down the best I have ever eaten. It was tender and flavorful. I would have far preferred a small order of pasta or two of my daughter’s ravioli on the side rather than the potatoes. I only ate about one bite of the potatoes because they were, well, ordinary. They were roasted potatoes. Put some spices on it! Something! But I would order the veal again in a heartbeat. 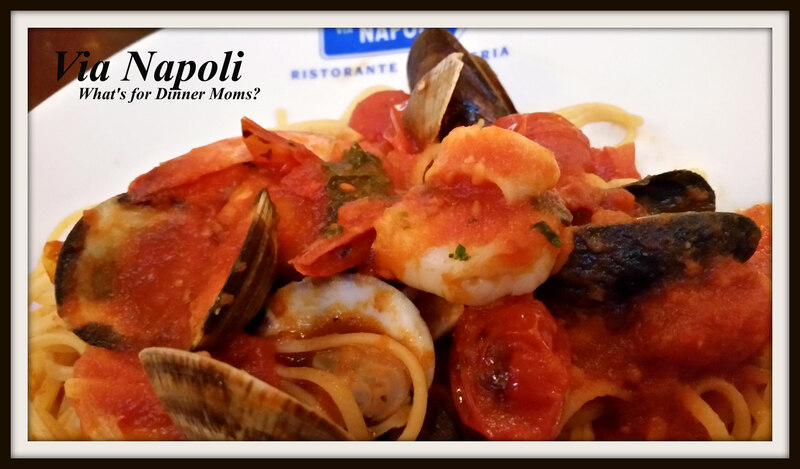 Linguini allo Scoglio (shrimp, clams, mussels and squid tossed with cherry tomatoes) was my son’s choice. He thought the seafood tasted fresh and being from Michigan we don’t get much fresh seafood so he loved it! Everyone finished their entire entrée but not necessarily the sides. We all wanted to leave room for desserts. 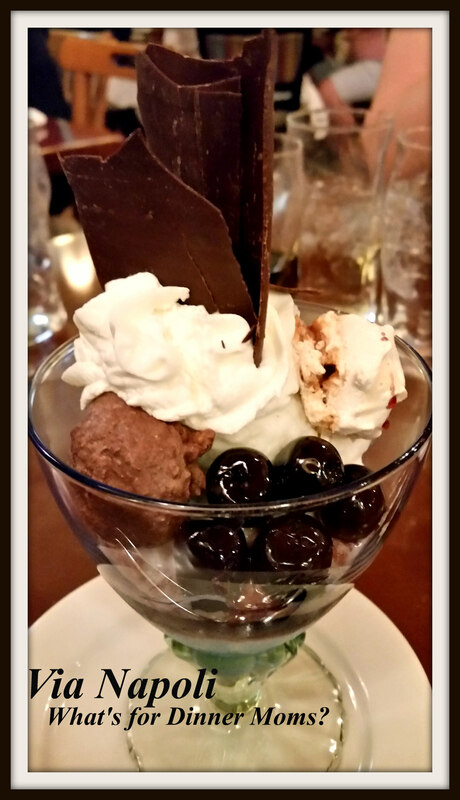 This was an amazing dessert! 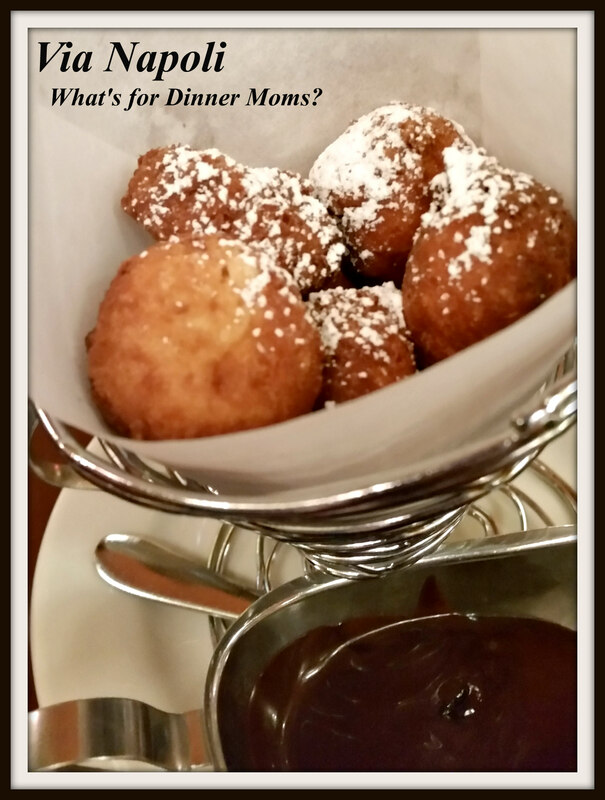 The ricotta fritters were light and fluffy and when dipped in the dark chocolate and whipped cream they were heavenly. I couldn’t finish the whole order though I really wanted to but thought better. Just thinking about them now makes me crave them! By the time we left Via Napoli at 8:35 pm the sun was setting. We had enough time to fight the crowds and make it back around to the front of Epcot before Illuminations started. We knew we wanted to be ahead of the crowds on this night. 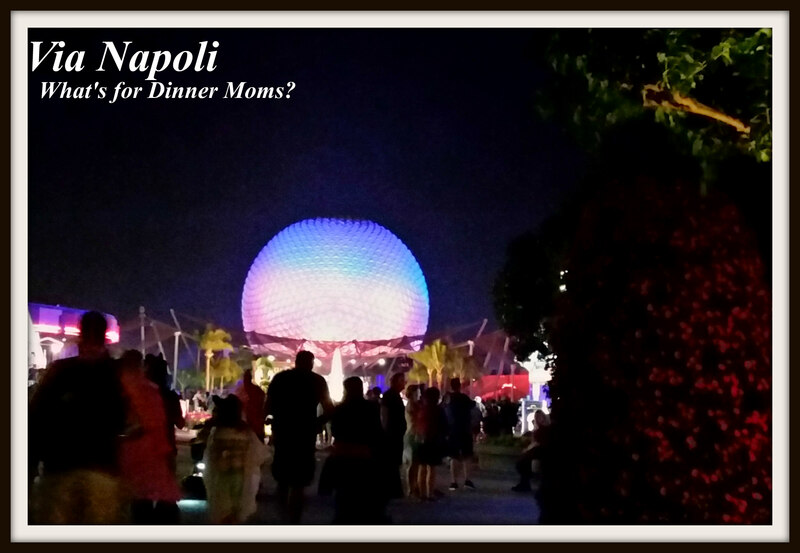 I loved the food at Via Napoli but I don’t know if I would go back. The noise alone was so off-putting that I don’t think I would make a reservation there until they redesigned the restaurant. I understand they were going for an open-air feel but what I think they created was a giant vessel that made the sound just bounce around. Thanks for your frank review and comments, Marcia. I would not go there as I am very sensitive to noise. It was a tough venue for those who are noise sensitive. Noisy loud restaurants drive me nuts too! I’m partially deaf in my right ear so I would not have liked this either. The food looks good though! The food was excellent but the venue was tough for those who have any sort of noise sensitivity. The food was very good at Via Napoli but not being able to hear someone sitting across from me was frustrating. I see people vote this their favorite restaurant but it cannot be for atmosphere. I think i’d have to order to go. Noise is annoying and doesn’t allow for an enjoyable meal. Thank you for these lovely ideas. So do you write this immediately after the experience, it is so detailed. Thank you! Yes, I try to write it within a day or so. I think the food is is very good, too. We always seem to be seated over near a window and it’s quiet there. I like when they perform out on the piazza. Now, I’m hungry and am going to put on some cheese ravioli for dinner.